Fox Run Vineyards owner Scott Osborn testified in favor of wine in supermarkets. Scott Osborn wasn't surprised by the phone call. In the back of his mind he had been dreading it. 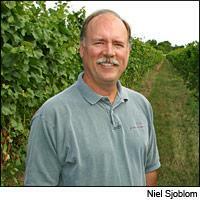 Osborn owns Fox Run Vineyards, a successful Seneca Lake winery in the Finger Lakes. One morning in January, a Rochester, N.Y., liquor store owner called because he wanted to know where Osborn stood on New York Governor David Paterson's recent proposal to allow wine sales in the state's grocery stores. Osborn thought the proposal was a good idea, but he didn't want to inject himself into the middle of what was undoubtedly going to be a nasty political fight in Albany. "I didn't want to deal with it," said Osborn. He told the man he was neutral on the issue. According to Osborn, the store owner told him that wasn't good enough and he was going to "begin to realign my products in his store." Sure enough, within days Osborn's distributor reported back that the store had moved Fox Run's wines to the closeout bin. The proposal to allow wine sales in New York supermarkets is a tiny item in Paterson's proposed budget for 2009-2010, which contains 137 new taxes, tax increases and fees, along with $9 billion in spending cuts. But the proposal immediately set off a furor among liquor store owners, and it has now become a battle between them and supermarkets, with local wineries caught in the middle. The idea may never have come up if New York was not facing a $15.4 billion deficit. Released in December and currently being debated in the legislature, Paterson's budget also proposes raising excise taxes on wine from 18.9 cents a gallon to 51 cents and eliminating state funding for the New York Wines & Grape Foundation. Paterson estimates that the state can raise $105 million next year by charging grocery stores various fees for the right to sell wine. New York is not the only state looking to its alcohol laws to help balance the budget. Tennessee's state senate is considering allowing wine sales in grocery stores. Several states hope allowing alcohol sales on Sundays could increase excise tax revenues. Arkansas just passed a bill, and Connecticut is considering one. A Georgia legislator withdrew his bill to allow Sunday sales after religious groups opposed it. New York liquor store owners quickly set up a coalition to fight the grocery store idea, called Last Store on Main Street. Posters appeared on wine and liquor store windows, asking customers to sign petitions and write their legislators. The signs read, "Save Our Stores, Protect Our Jobs, Protect Our Teenagers." Every week the coalition has held events in various areas of the state, protesting the idea. Grocery store companies were slower to respond, but a few weeks ago they hit back. At one of Whole Foods' Manhattan locations in Columbus Circle, tables were set up with petitions so customers could lobby their legislators to pass the proposal. Regular announcements over the store PA system urged everyone to sign. Wegman's, a regional chain with a strong presence in upstate New York, also began putting out petitions and set up a website to educate consumers. Meanwhile, lobbyists from both sides have been meeting with legislators. The Democratic-controlled state assembly will release its version of the budget next week. "[Liquor] store owners feel like the governor is pulling the rug out from under them," said Mike McKeon, a spokesman for Last Store on Main Street. Those owners built their businesses on the understanding that they wouldn't have to compete with big supermarket chains. The coalition claims Paterson's proposal will force 1,000 stores to close. "People are sensitive to the government putting people out of business in this economy," McKeon said. He also argues that grocery stores won't be as vigilant asking customers for ID, leading to an increase in teenagers getting their hands on wine. For supporters of the proposal, those arguments don't stand up. The supermarket industry groups have conducted their own research. They say wine sections in 19,000 stores will create 2,000 new jobs. They also say they've polled their customers, and more than 70 percent support the idea. They point out that liquor stores still exist and still make money in the states where supermarkets can sell wine. And wider access to wine should increase sales by 20 percent, they estimate. As Osborn's story demonstrates, New York's wineries find themselves pressured to pick a side. After the first threatening phone call, Osborn decided he might as well commit himself to the struggle. He testified before a committee in Albany in early February and has made additional trips to lobby in favor of the proposal. From his point of view, gaining access to 19,000 more stores is crucial for his winery's future. He sells about 30 percent of his wine in retail stores now. He sells half of his wine himself, in the tasting room or by direct shipping. He complains that wine and liquor stores claim supermarkets won't bother to stock New York wines, preferring big California brands, but wine and liquor stores don't carry that many New York wines anyway. "Not a single store in New York City carries my wines," said Osborn. "The number of wineries in the state increases 10 percent each year. We can't sell all that wine in liquor stores." Since Osborn's testimony, he says, the winery has been flooded with angry e-mails and phone calls from liquor store owners, telling him they won't carry his wines and they'll make sure he goes out of business. Osborn says he's referred the threats to the authorities. McKeon denies there's a pattern. "We're aware of one incident—anyone who does that is acting inappropriately," he said. McKeon points out that 85 wineries have signed Last Store on Main Street's petition, including many on Long Island. "Big box stores are only going to carry big box wines," said David Page, co-owner of Shinn Estate Vineyards on Long Island's North Fork. But he does admit, "I lived in California [where wine is sold in grocery stores], and it seemed like wine stores managed to survive." A few winery owners, who did not wish to be named, said they felt pressured to support the liquor stores. The legislators negotiating over the details of the bill are exploring compromises that might soften the blow for wine and liquor stores. One idea is to remove restrictions on such stores—currently they are not allowed to sell food or party supplies. They are also forbidden to have more than one location, which makes expansion near impossible. Other proposals on the table include forbidding a grocery store from selling wine if it's located within a certain distance of a wine and liquor store and prohibiting grocery stores from selling wines made by producers who make more than a certain volume each year. The volume cap would be set so all New York farm wineries would be allowed in supermarkets but most large brands would not. Whether that would hold up in court is questionable. A federal judge struck down a volume cap law on direct shipping permits in Massachusetts recently, arguing that it was a discriminatory way of keeping out-of-state wineries from shipping into the state. What's clear is that no matter the result, all sides are in a furious battle over their turf. But is anyone speaking for consumers' best interest? One liquor store owner, Daniel Posner of Grapes the Wine Company, in Westchester County, has a different perspective on the issue. In a recent newsletter to regular customers, he weighed in: "A local store here sent out their weekly reminder, asking their client base to write their local politicians to ask that New York not pass the law that will allow wine in supermarkets. I say, write your politicians. Tell them to sell wine in supermarkets! Tell them to let wine stores ship into your home state! Tell them to get a life! Buy wine wherever it makes you happy."